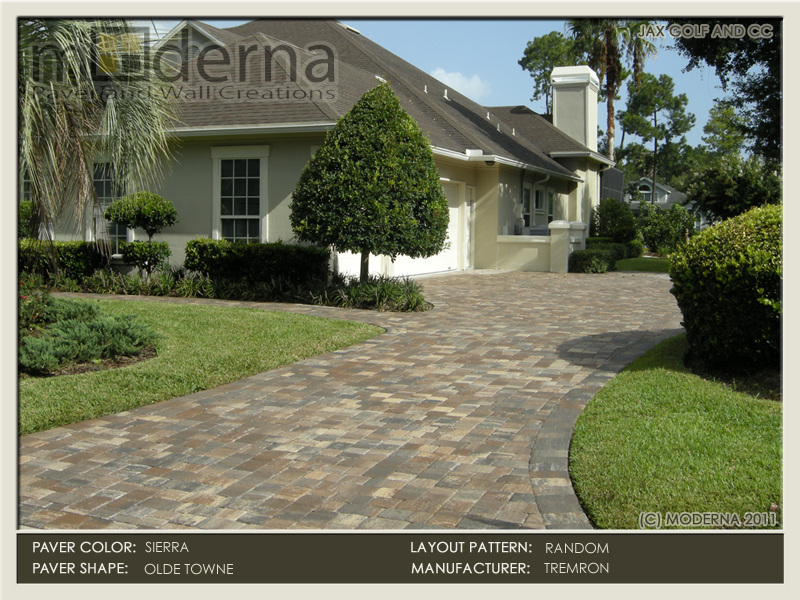 Paver driveway, walkway and Entry in St Johns County FL. 3 Piece Olde Towne style pavers in a random pattern. Ash color with Taupe border. Jacksonville paver driveway installation. 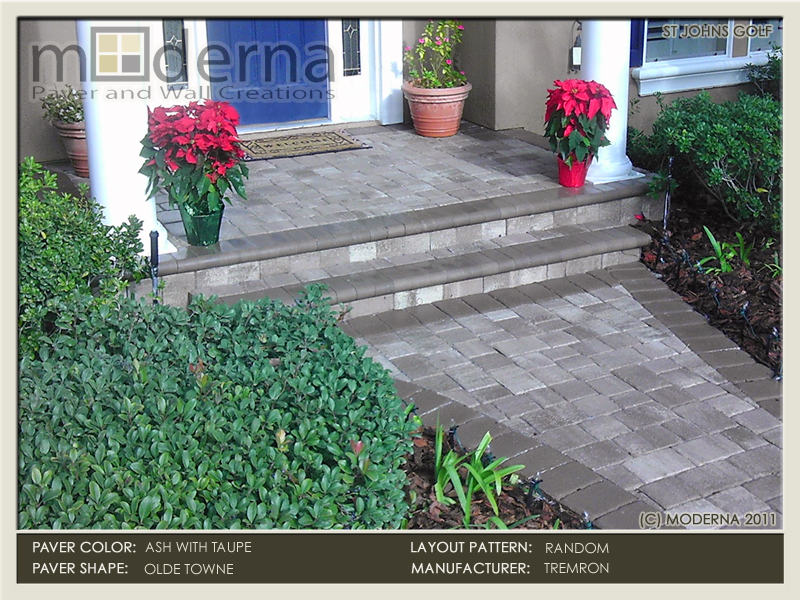 Pavers featured are Tremron's Olde Towne in a random layout pattern in Sierra Color. Jax Golf. Paver patio in Jacksonville FL. Square 18 x 18 Plaza pavers with a 4 x 8 border. Pavers are Sand Dune color. Wall is Country manor style in Sand Dune. Jacksonville brick paver patio installation. Pavers are Tremron's 3 Piece Mega Olde Towne pavers in a random layout with a 6 x 9 border. Sierra color. A new custom cedar pergola with a paver patio, seating wall, and steps. The paver and wall is Oak Run color. Queens Harbor Yacht & Country club. A terraced paver patio with steps that lead around a koi pond with waterfall. Riverwood color, three piece olde towne pavers. St Johns County. Paver driveway in Jacksonville FL with landscape curbing. Pavers are 3 piece Olde Towne with a 6 x 9 border. Paver color is Riverwood. Paver driveway installation in Jacksonville FL. The pavers are Tremron's Olde Towne pavers with a 6 x 9 border. Color is Sierra. Brick paver patio in Jacksonville Beach featuring a stone fire pit. Pavers are Oldcastle's Oak Run in a 2 piece T Pattern with rectangular border. 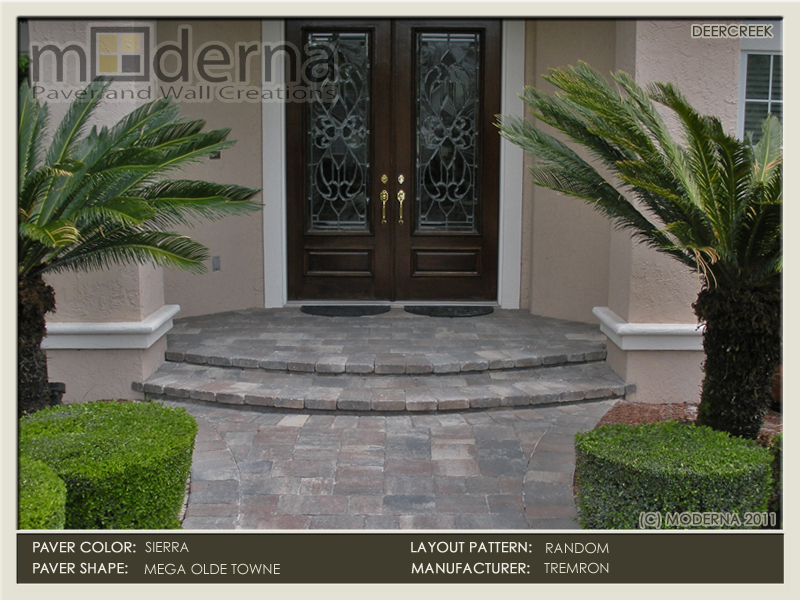 Paver walkway and Entryway in Jacksonville FL. This paver step makes a nice curve to accent the architecture of the entry. A brick home in Jacksonville Golf and Country Club featuring a brick paver driveway done in the Stonehurst line of Pavers in the Sierra color. Ourdoor living area with pavers, fire place, seat wall, and columns. The pavers here are Olde Towne style in the Cappuccino color. Jacksonville FL. Paver driveway in 12 x 12 square Plaza series pavers. The driveway is laid in a diagonal 45 degree pattern. Bordered with 4 x 8 soldier course. The Oak Run color is Grey and Tan with a subtle amount of Coral. The coral comes out just a bit in this photo of a brick paver driveway installation. Timberwood color paver driveway in 4 x 8 shape with the Herringbone pattern. The 4 x 8 pavers were also used as a raised edge around the plant beds. Paver walk and entry. This was an amazing transformation from a small square walkway and crowded entryway. Olde Towne, Summer Rose color. A fire pit with a surrounding seating wall in Jacksonville FL. THe patio inside the seat wall utilizes a circular paver pattern. Sierra color pavers. Pool Deck in Ponte Vedra beach FL. 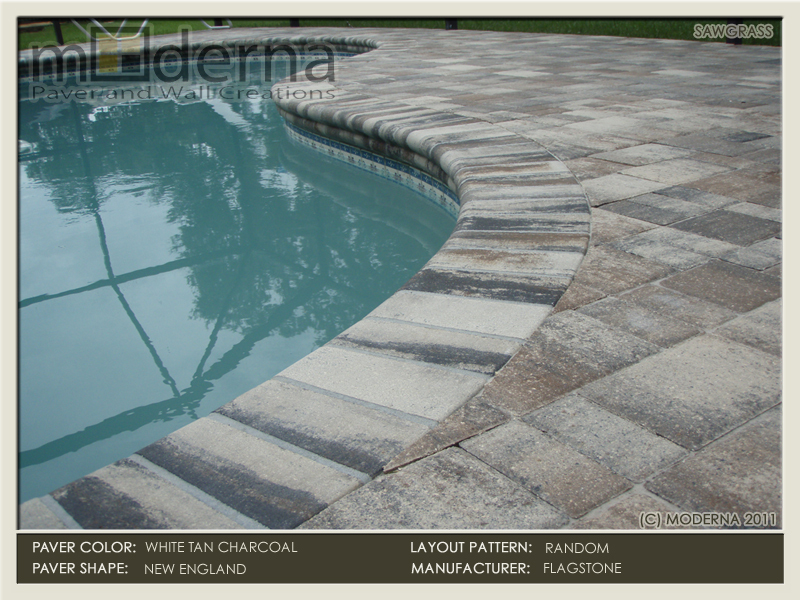 The pool deck and bullnose coping is a White, Tan and Charcoal blend pavers. Pavers are a 3 piece cobble. 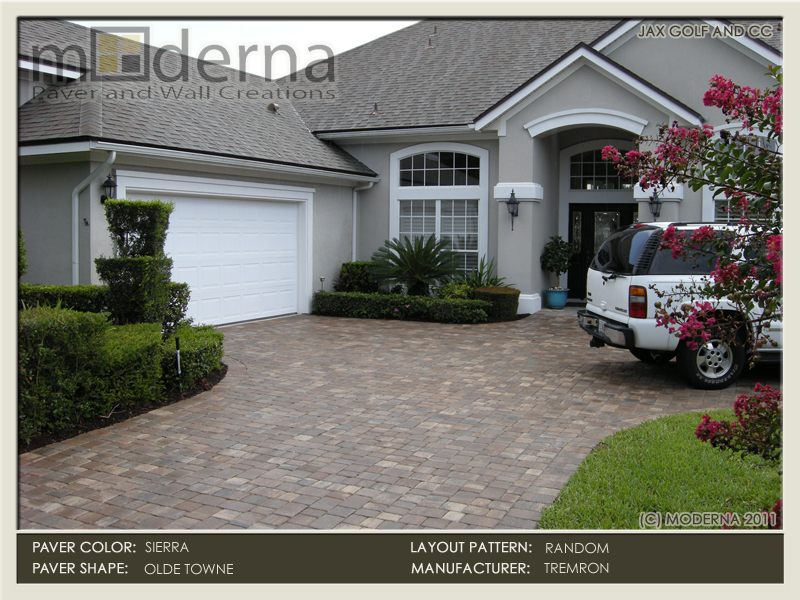 Paver driveway in Orange Park FL with a circular inlay in the courtyard area. The circle pack and surrounding pavers are Oak Run color. 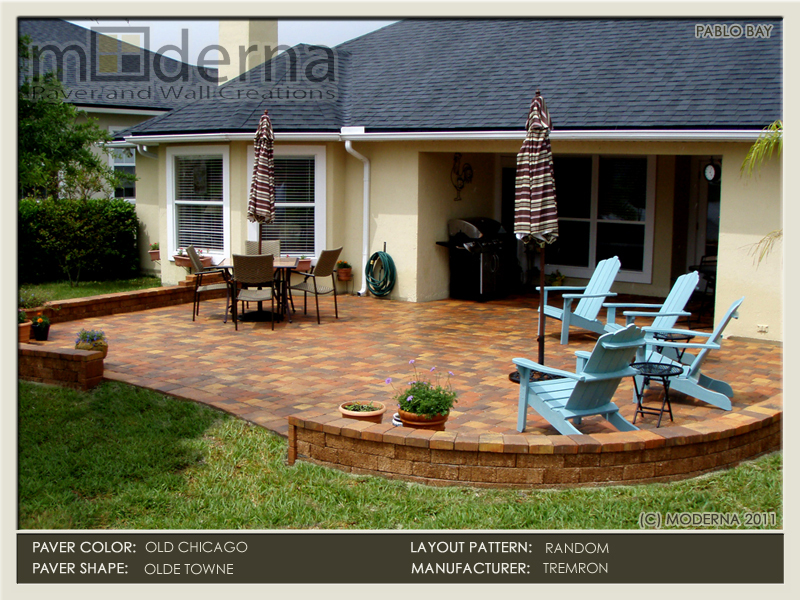 A raised backyard paver patio with retaining wall and steps. 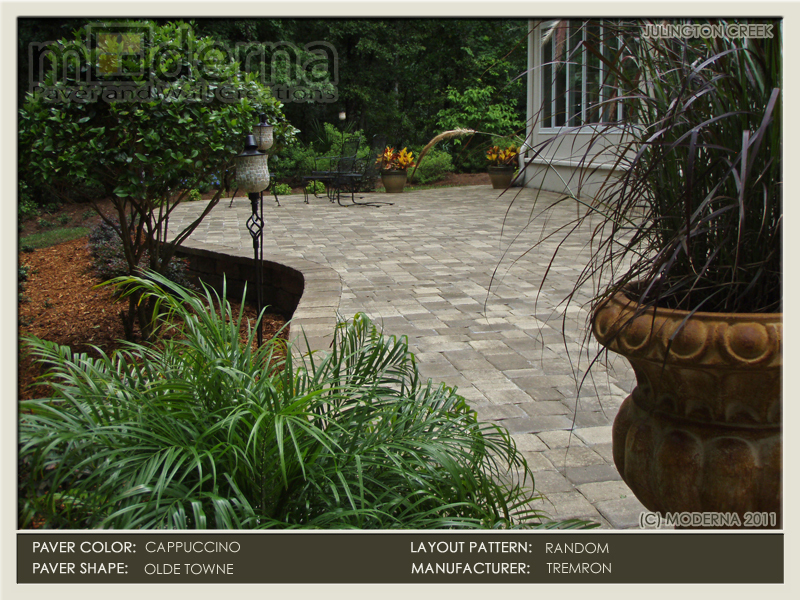 This paver project uses Olde Towne pavers with the Cappuccino color. This hardscape construction project features a seat wall surrounding the paver patio that also serves as a plant bed. The pavers are Mega Arbel in Stone Harbor. A quaint paver patio in Jacksonville Beach FL. The pavers are situated between two waterfalls, a stone fire pit and beautiful landscaping. This paving stone patio features a small retaining wall around the perimeter with a small opening facing the lake. Olde Chicago color. A paver wall and walkway using the Olde Towne 3 piece style pavers. The color is South Beach, a blend of Peach, Coral, and light Grey. A 4 x 8 brick paving patio with several steps leading to the yard. The pavers are Herringbone pattern and have blended colors of Red and Charcoal. The Sante Fe color is blended with Tan and Charcoal. 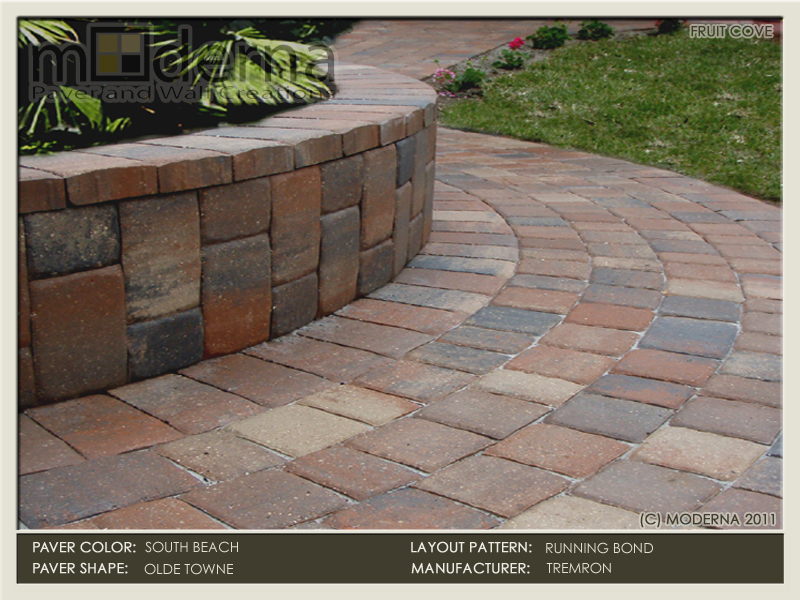 This patio features the Running Bond pattern in 3 piece cobble paver with a 4 x 8 border. A paver patio and seating wall arounding a fire pit overlooking the marsh and intracoastal in Marsh Landing Golf and Country Club. 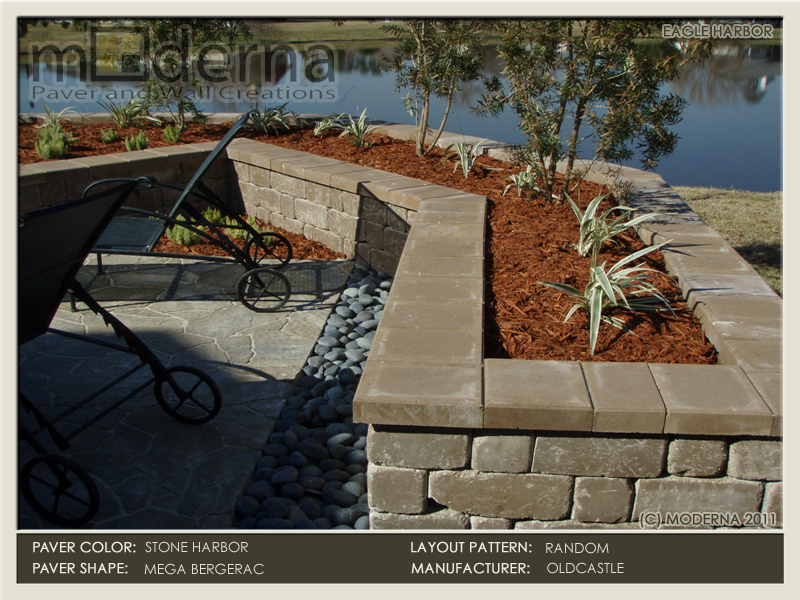 A 3 tiered seating wall overlooking the lake in Marsh Landing FL. The pavers, wall, edging, and cap are all Sand Dune color. The two entryway steps were curved for a nice touch at this Deercreek Golf and Country Club home in Jacksonville FL. The color used is Sierra. This fire pit and seat wall is anchored by a three sided "curved" pergola. 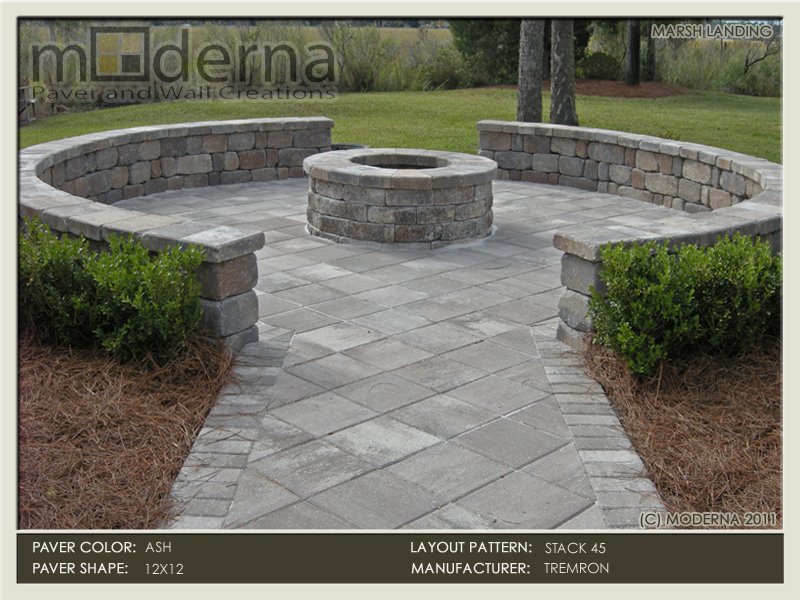 The fire pit, pavers, cap, and seat wall are Sierra color.